From GeoURL to vCard, people are publishing geo and location information on blogs and the web in many different ways. What are the advantages and disadvantages of all these various current practices? Is there a possibility of proposing a simple microformat that addresses today's practical needs while allowing for more precision and flexibility in the near future? Join us in a discussion of current formats, current needs, and what we can do to work on defining a geo/location microformat. Now, being able to subscribe to an event calendar is very handy, but there is a much simpler way - using hCalendar and Brian Suda's x2v calendar parsing tool. I adapted the conference calendar page, to add an "hevent" to each session ( with help from Ryan and his hCalendar creator). I'm at Supernova today speaking with Tantek, Rohit and lots of other microformat adopters. We've just launched microformats.org as a home for this new movement. The conference tag is supernova2005. I got a lot out of the first Tag Tuesday, and met lots of people with interesting ideas. As requested, here are the slides I projected on the ceiling. Eran Globen took good notes on me and Stewart speaking down by the bay, before tsunami warnings broke the meeting up. Donna's posting of EFF's legal guide for bloggers reminded me that a DMCA takedown can be used for good as well as evil. There are spammers who copy entire blog posts from others to act as fresh bait for their search spoofing tricks. This is commercial use, and a violation of most CC licenses (and indeed default copyright).Stephanie Booth recently did this to a spammer at www.famous-people.info who plagiarized one of her posts which mentioned Jennifer Garner in passing, on what was a Google Adsense supported spamblog. When she sent a DMCA notice, they took down the page and apparently lost their Adsense status. Danny Sullivan has a similar problem. I have heard it argued that using the DMCA for this is encouraging reliance on what is in many ways a bad law that should be repealed, but in this case I think it is very positive, as it reinforces the 'everyone is a publisher now' worldview that CC and EFF promote. The DMCA's most pernicious aspect was the distinction between "professional" businesses who are allowed to copy video, and the general public, who aren't. Copyright makes us all publishers by default, so we should take advantage of this. PING famous-people.info (65.77.133.197): 56 data bytes then whois 65.77.133.197 that IP address, you can find the host ISP, and send them a DMCA takedown notice, which they have a procedure in place to deal with. With many thousands of users adopting tags, we thought it would be a good idea to gather tag developers every month to exchange ideas, and encourage code that works well together. Meet other Bay Area tag developers, and hear Stewart Butterfield of Flickr and Kevin Marks of Technorati talk about tags. Also, there is a new Tag Tuesday blog. Jobs demo'd Podcasts with chapters in iTunes, so how about his keynote with chapters too? Here's Apple's tutorial on how to make chapters - QuickTime has had this feature for over 10 years, so we can only wonder why Apple don't use it themselves. As to the topics of the speech, running bits of Mac OS on Intel has been going on since 1996; the tricky part of it is getting endian-flipping right when serialising to disc, as Greg Chapman's technote from 2000 makes clear. You don't know you have it right until you have written and read files both ways between different endian architectures. Chapters in podcasts is a good idea, but this needs a bit more to be actually useful - it needs iPod support (the skip button going to the next chapter), and we need the info back from the iPod about which tracks and chapters have been played, and which ones skipped. With that there are a lot of interesting things that can be done. 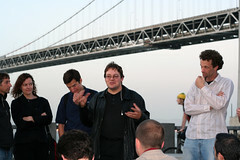 Scoble issued an invite to Bitman's place, a site supposed to teach children about computing. So, always keen to find something interesting for my boys, I had a look. The first 'game' is 'configure the computer system for the characters'. You get some virtual money and have to choose a system config (CPU, RAM, drive, Fan, video card etc) for different uses. You pick a bunch of components and the bloody thing flakes out because of some internal dependency between them. This is not teaching about computers, this is teaching how broken the Wintel purchase process is. Sorry Robert, go buy that team Logical Journey of the Zoombinis and get a sense of how you teach through play.